The T129 ATAK helicopter has been in use in operations against the PKK terrorist organization in the southeast for the last few years. Turkey has long been referred to as a regional power that aims to gain influence over its narrow sphere through its soft power and it decisively keeps itself out of conflicts in the region. The country maintains a large military force whose armament and technology was provided from foreign suppliers, particularly from the U.S., Germany and Israel. This situation caused the country to be dubbed "NATO's farthest outpost," since Ankara has played a transient role in the bloc's military actions in the Middle East with its bases and logistical support, and it also actively participated in peace-keeping and post-war actions in various countries, instead of pursuing its own agenda and protect its interests. However, in recent years, the country took a noticeable leap forward with innovative engineering moves in the defense industry and domestically developed military equipment and combat vehicles in almost all fields of warfare, most notably the Altay (Battle Tank), the Atak (Attack Helicopter) and the Anka (Unmanned Aerial Vehicle). A national military surely brings with it the ability to meddle in regional policy-making on crucial issues. "The most important reason behind the defense industry's development is President [Recep Tayyip] Erdoğan's embrace of the industry for many years, and he has been looking out for its importance. This support instills confidence in state and private companies that want to invest in this field," Yusuf Akbaba, a defense industry researcher, told Daily Sabah. Turkish defense and aviation industry exports have almost doubled in the past five years, reaching $1.68 billion in 2016, according to export figures revealed by the Turkish Exporters' Assembly (TİM). During this period, the sector has also significantly diversified the markets to which it exports. Akbaba emphasized that there are two main reasons for the diversification of exporting countries. "Some states cannot buy weapons from Western countries for various reasons. When their demands failed to be met in such cases, they turn their faces to Turkey first as a substitute for the West, thanks to the country's active foreign policy during recent years. On that point, I want also to remind you that Turkey is dependent on other countries for many sub-systems related to industry too," he said. The developments of the Turkish defense industry triggered a rise in its own sufficiency rates. At the 13th International Defense Industry Fair 2017, Defense Minister Fikri Işık announced that Turkey's own sufficiency rates have surpassed 60 percent. Previously, officials stated that the country aimed to reach 100 percent self-sufficiency by 2023. Another defense industry researcher, Turan Oğuz, said that such self-sufficiency is neither necessary nor realistic. "The U.S. and Russia, which are regarded as the most self-sufficient countries when it comes to the defense industry, are not in such situation," Oğuz said. "It is important to have the capability to domestically produce all the critical parts in case of an embargo. Domestically producing the pieces that you may easily deliver from various suppliers is not essential." Apart from its economic aspect, the technological advances that brought self-sufficiency to the military have also helped Ankara re-shape its foreign policies, embracing a more intimidating stance against external national security threats. As a result of this shift, Ankara launched the cross-border Operation Euphrates Shield in Syria on Aug. 24, 2016 with the aim of eradicating the threat posed by terror groups on its southern borders, including Daesh and the PKK's Syrian offshoots, the Democratic Union Party's (PYD) and People's Protection Units (YPG). 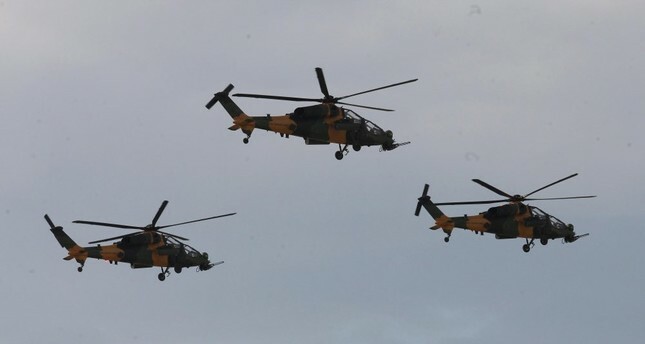 It became the first cross-border operation conducted by the Turkish Armed Forces since 1974, after Cyprus, apart from short crossings over the Iraqi border for anti-PKK operations. During the operation, Ankara often neglected U.S. objections to the YPG being a target, citing national security concerns due to the YPG's strong links with the PKK in terms of supply and leadership. Oğuz said that apart from the planned breakthrough process after 2007 in the industry, the increased threat level surrounding Turkey forced it to manufacture urgent supplements. "Likewise, deficiencies on the battle field necessarily backdate some development projects. We witnessed at the IDEF exhibition how quickly the Turkish defense industry met the demands of exact projects," he added. Even though experts acknowledge Turkey's considerable progress in its defense industry, they point to significant deficiencies that need to be resolved in order to advance to the top league in the industry. Oğuz said that the government has to consider a strategic plan and stimulus package, especially for private companies who want to invest in the defense industry. He also drew attention to the "inadequate defense budget" as regards to regional threats and present conjunctures. Akbaba said that Turkey's main deficit in the field is the absence of a qualified labor force, especially regarding engineers and technical personnel, as with the exception of a few, Turkish universities "are not able to educate people expediently for working in the sector." He defined the second important deficit as engines. "Because the country cannot manufacture domestic engines, there is a danger of being restricted in all fields regarding the sector. The government should particularly approach the engine issue to solve this deficiency," Akbaba said. In addition to developments in the weapon industry, the country has been establishing two foreign bases in Qatar and Somalia, where Turkey is planning to deploy military entities and train local forces. There are also reportedly two bases in Azaz and al-Bab, towns in northern Syria that are constructions-in-progress. "The base in Qatar will give a sense of security to Ankara's ally, as well as functioning as preliminary outpost against threats that can arise from the Gulf of Basra," Akbaba said. "Likewise, Turkey will protect its commercial interests in the Gulf of Aden via its military base in Somalia."